worried your guests won't mingle? bring out the casino! Q: Is it legal? Does my venue need a licence? A: We run and manage all of our events in line with the British Gaming Laws and so yes it is 100% legal and actually no money is involved on the night. The venue does not need a licence. If you would like more details on this please do not hesitate to contact us. Q: How do the games start? A: Croupiers on the night will distribute playing vouchers to all of your guests which are then used to buy chips at the gaming tables. These playing vouchers can even be personalised. Q: How do we know who has won? 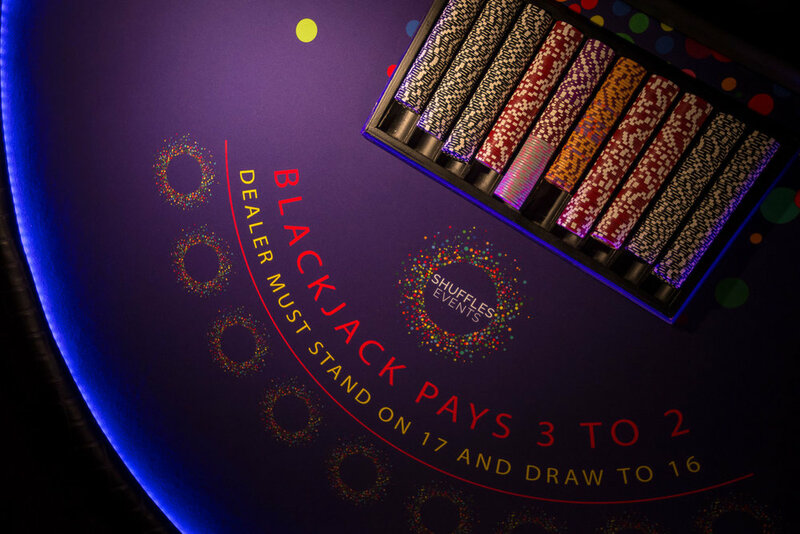 A: Our croupiers will manage the scoring for you and at the end of the evening the player with the highest amount of chips is announced as the winner! This can be announced by us or passed on to the event organiser or DJ to announce. Q: Is there a prize for the winner? A: Yes, this is provided by us as bottle of Champagne for the lucky winner. You can even add to this and give out extra prizes for 2nd and 3rd too if you wish and can be anything. Prizes always encourage a bit of friendly competition! Q: Can we raise money at a Charity casino night? A: There are lots of ways to raise money for charity through a fun casino, we have helped raise money at 100's of events. We have several tried and tested methods including selling the playing vouchers to your guests, or by inviting companies to sponsor a table. Q: What do the tables look like? A: All of our tables and equipment are casino grade and full size. They are easily transportable and are assembled by the croupiers at your event in around 15 minutes. The tables were new in 2017 and have incredible LED lighting. Q: None of our friends know how to play, can you teach us? A: 100% Yes - All of our croupiers are really friendly and will teach any of the games in a way your guests will understand. We are happy to demystify any casino jargon and will create a friendly non intimidating atmosphere for everyone. Q: What casino games do you supply? A: Roulette & Blackjack - Poker subject to availability. Q: How many tables should I book? A: This is very difficult to judge and depends on the number of guests you have and if there are any other activities running at the same time. We usually suggest a 2 table package for events of up to 75 guests, but supply anything up to 5 tables for larger events. Q: Can I have the table in my own home? How much space do I need? A: We can set up the tables anywhere and it is fantastic after-dinner entertainment. For a roulette table you will need approximately 3m x 1.5m and for the blackjack table you will need 2.5m x 1.5m. Q: What do the croupiers wear? A: Our female croupiers wear black cocktail dresses and gents wear tuxedo trousers, dress shirt and black tie. If you have any other questions, just use the live chat feature (bottom right), email us at info@shufflesevents.co.uk or better yet give us a call on 01983 898314. We are always happy to help and pride ourselves on our incredible customer service.